The tactics of ancient Rome were so formidable for their time that, even after 2,000 years, military schools and colleges around the world still teach them. Although the organization of troops used by the Romans was predated by the Greeks of Macedonia, the Romans took this organization to whole a new level. Many would argue that the success was the standardization of equipment and training, including various commands which every unit immediately understood. 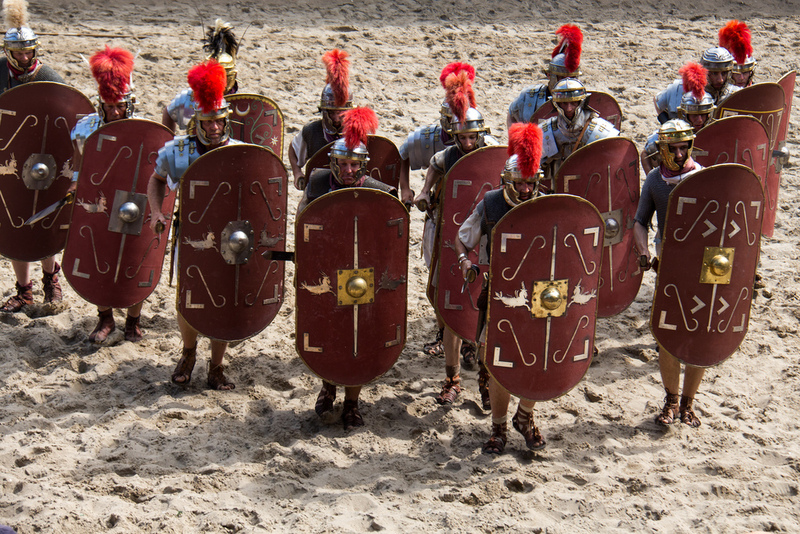 As the Roman Empire grew, so did the military’s tactical toolbox. While supremely adaptable, there were three tactics that endured the duration of this great empire. While old, the wedge was an extremely effective offensive military formation. It was designed to cut through enemy lines and confuse their cavalry. Legionaries would form the shape of a triangle pointing towards and charging directly through the enemy. Each soldier was close enough to his next comrade in the formation so they could defend and protect each other. The main weapon they carried was a gladius (sword). When the general yelled “cuneum formate”, the legionaries would form a wedge and charge at the opposition. The point of the triangle pointing right at the enemy was made up of the most experienced and best troops. This concentration of power allowed the formation to drive a wedge into the enemy forces that were then widened by the rest of their formation. The wedge was used often, most notably at the Battle of Pydna in 168 AD, which helped end the empire Alexander the Great had previously founded. This is probably the most famous and recognizable formation. It’s easy to see how this formation got its name. 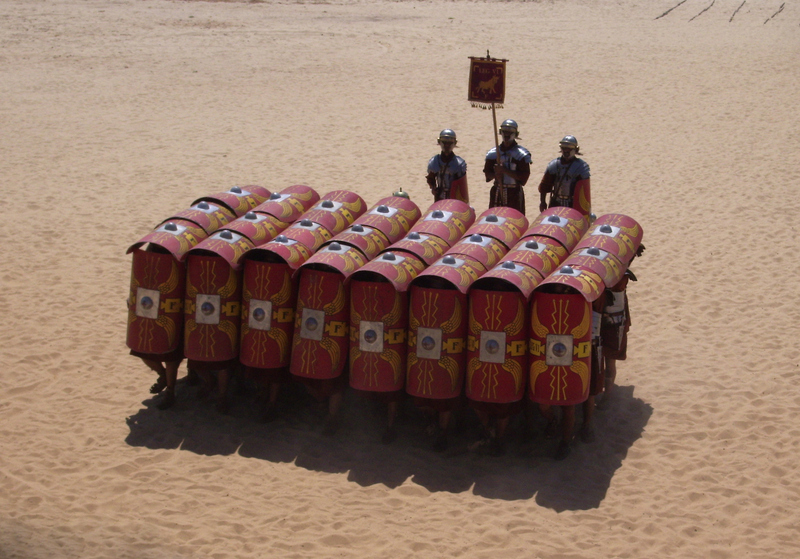 The testudo (Latin) or tortoise formation was a type of shield wall formation commonly used by legions during battles and sieges in particular. The soldiers would form a tight block formation, with the front rank kneeling behind their interlocked shields, which measured over a meter in height. The second rank would place their shields over their heads to protect the formation from attacks from above, balancing the shields on their helmets and overlapping them. While it was possible to march in the testudo formation, the speed of which the unit would travel would be tortoise-like. It was usually used in response to distant missile fire. This is how I imagine my Roman troops besieging a nearby village! This formation was formed by three ranks, with the Hastati(the least experienced troops) in the first rank (closest to the enemy), the Principes (men in their prime, with good equipment) in the second rank and in the final rank the feared Triarii, the most heavily armored elite soldiers of the legion. When defeat was near, the first and second lines usually fell back on the Triarii to allow either for a counter-attack or a withdrawal. The three lines would often line up, with alternating gaps, creating a wider but still fighting front that looked apparently unbroken. “Falling on the Triarii” or “ad triarios rediisse” in Latin became a common Roman phrase indicating a person to be in a desperate situation. Thank you for reading this edition of Tribe History! We hope you enjoyed the historical information. Next time you’re under attack by Romans, or are attacking another village as a Roman, imagine the troops using these tactics!